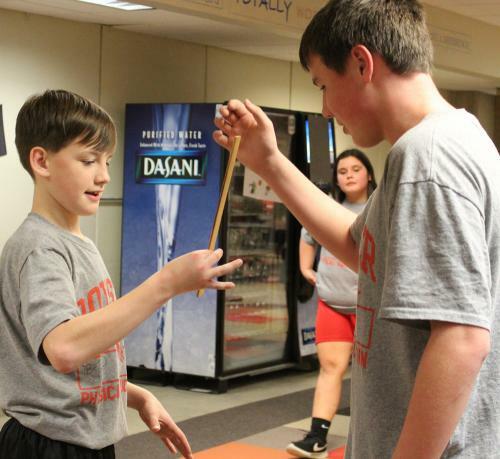 Royster physical education teacher Teri Lund has found the incentive to keep kids moving in her class - money. 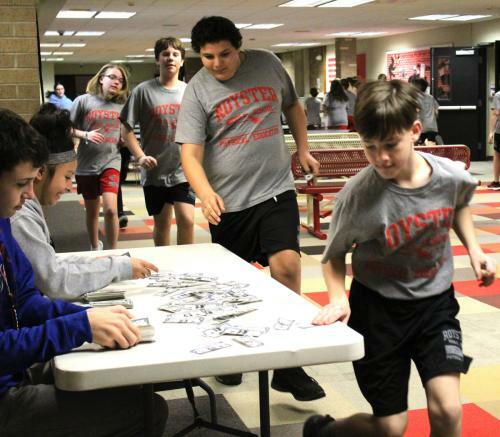 For every lap around the exterior of the commons area at the middle school, the students pick up a “dollar” from the banker’s table along the wall. Two students run the Bank, keeping the laminated play money within reach of the students flying past as they complete another lap. The students actually have two ways to make money. They can continue to accrue dollars for each lap, or they can stop and catch their breath in the center of the room and challenge one another in a card game, dice game or arm wrestling match. For instance, a student finishes a lap, stops and then lays down two dollars and challenges another student to roll the highest number using a pair of dice. Or one might challenge a dollar to be the first one to roll doubles. The winner gets the money and can continue to play another game, challenge someone else or resume running laps. 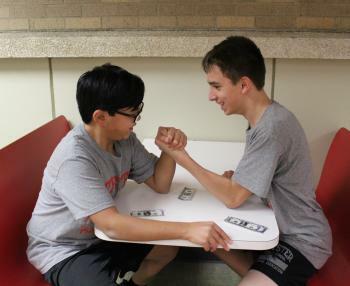 They can also challenge each other to turn over the highest number from a deck of cards; test for fastest reflex by dropping a ruler between another’s fingers to see how quickly they catch it; or arm wrestle for a dollar or two or five. Even if they stop to challenge each other for a minute or two, a lot of laps are being run within the given time frame, which is exactly what Lund wants. At the end of the class period, the student with the most money has to count it out loud back to the banker, before choosing a prize from Lund’s stash of gadgets.